Professional Security Systems by IXS Tech is a Greater Atlanta-based security company specializing in commercial business security with cutting-edge technology, equipment installation, and maintenance. Professional security system for warehouses are often a key feature to standardization of a daily basis workflow operation. 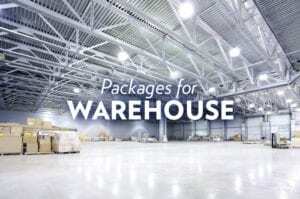 Usually, the warehouses are build big enough for a human eye to not capture the whole facility and give you difficulty to maintain order and control of the premises. The proper security system will deter theft, reduce loss, protect cash flow, safeguard employees, customers, and protect property. These benefits are then leveraged even further when you consider the possibilities of improving employee training, operational workflow, and incident response with the information you receive through our system. Every company is unique and some properties are more unique than others. Whether you operate a parking facility, drive thru pay booths, manage multiple business locations, or operate a combination of conventional and unconventional business sites. Our experienced professionals can customize your project to ensure the highest level of safety and security for your business. – Monitor and control water pump and link it to central alarm controller. As retail store owner or/and manager, often you find yourself need for “few more eyes” to control and capture your business work flow and standardization.